This fun, flirty strapless dress comes in two great colors and is perfect to wear to any event on your calendar. The Shirred Contrast Waist Strapless Drape Dress is fully lined and crafted of a fluid chiffon fabric that floats and flutters. It has ruched fabric draping and shirring at the bust as well as princess seams. An attached contrast waistband gives way to the draped fabric skirt. This dress has included spaghetti straps that can be attached and worn if you desire. An invisible side zipper completes this look. The Shirred Contrast Waist Strapless Drape Dress would be perfect paired with black pumps and a clutch for your next event. Fully lined. Adjustable and removable spaghetti straps. Invisible side zipper. 60% silk, 40% polyester. Hand wash cold water separately. No bleach. Hang to dry. Small measurements: Length from top of bust to hemline: 29”. Bust: 32”. You have added Shirred Contrast Waist Strapless Drape Dress in Royal Blue into Wishlist. You have added Shirred Contrast Waist Strapless Drape Dress in Royal Blue for Stock Notification. You have set Shirred Contrast Waist Strapless Drape Dress in Royal Blue as a loved product. 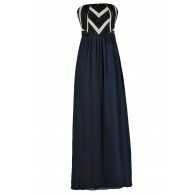 You have removed Shirred Contrast Waist Strapless Drape Dress in Royal Blue as a loved product.